Manchester United signing Anthony Martial says his family are "a bit nervous" about his record transfer fee but that he is not worried about it. Martial, 19, became the world's most expensive teenager when he joined from Monaco for £36m on deadline day. The fee could rise to £58m depending on conditions including Martial winning the Ballon d'Or award. "I don't know if I am worth 80m euros but I don't worry about the sums," said the Frenchman. "I'm going there for the football side of things - the price is between the two clubs and I don't see myself under any pressure. "My family were really happy for me that I am going to such a big club. They were definitely a bit nervous given my high price but I am going to stay focused on proving my worth." 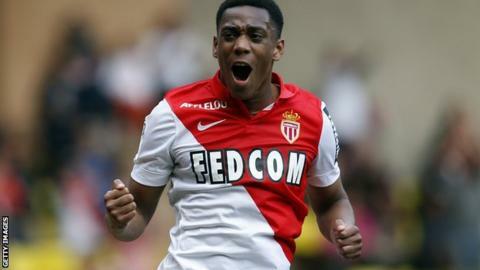 Martial has scored 15 goals in 70 appearances for Monaco and linked up with the national side for the first time this week. He scored four times in 12 games for the France Under-21 side. "Manager Louis van Gaal asked me my preferred position," Martial said at a media conference for France's friendly with Portugal on Friday. "I prefer to play in the centre but he told me I could play in a number of positions - it is the coach who decides but whatever position I play, I will do the best I can." Martial could make his debut for United against Liverpool in the Premier League on 12 September.